The Newton-Wellesley Mammography Program is licensed and inspected by the State of Massachusetts yearly, certified by the FDA and accredited by the American College of Radiology. All radiologists in the Women's Imaging Center are board certified by The American Board of Radiology. All mammographers are American Registry of Radiologic Technologists in both radiology and mammography and MA state licensed in radiology and mammography. The Center offers high-quality care and has been designated as a Center of Excellence by the American College of Radiology. The designation shows that the Breast Imaging Center meets the highest standards of the radiology profession. 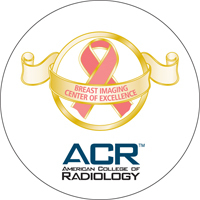 Center of Excellence designation is awarded to breast imaging centers that have demonstrated excellence in breast imaging by achieving accreditation in mammography, breast ultrasound, and ultrasound-guided biopsy and stereotactic breast biopsy.